Occupying a 17th-century building, this charming hotel features antique furniture, exposed beams and a flower filled patio, creating an intimate, welcoming air. 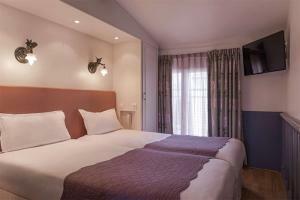 Tastefully decorated rooms include cable TV, mini-bars and free Wi-Fi. The Best Western Gaillon Opera is located on a quiet street within walking distance of the Paris Opera and the Louvre, as well as the Latin Quarter and Notre Dame Cathedral. Located approximately 22 miles from Charles de Gaulle Airport; Orly Airport is about 11 miles away. The nearest metro station is Pyramides, less than a quarter of a mile from the hotel.